It was fifty years ago that the Battle of Rorke’s Drift was immortalised in the film Zulu, on the 85th anniversary of the action. So it seems appropriate to reproduce The Vintage Magazine’s article , ‘A day in the life of Lt John Chard, Royal Engineers – 22 January 1879’. Whilst the film was not a documentary and for the sake of a good story the historical facts may have been tinkered with, overall it is down to this film that the Battle Of Rorke’s Drift did not just become another forgotten foreign war. 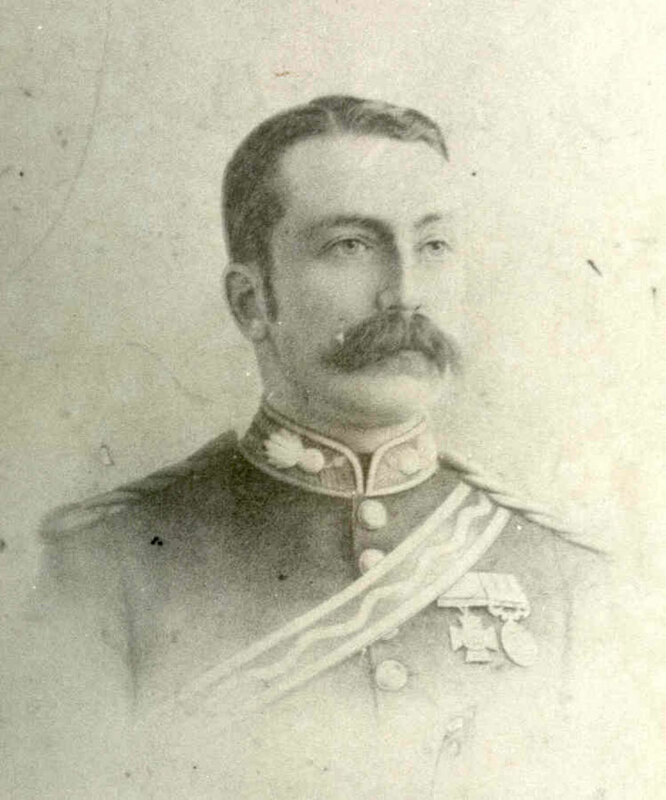 However to put the record straight there are a few misconceptions that should be put right: In the film, Zulu, Richard Burton describes the defenders of Rorke’s Drift as South Wales Borderers, in fact this regiment was not founded until two years after the battle; Nigel Green who was cast as the imposing middle-aged Colour Sergeant Frank Bourne, was actually 24 years old and only 5ft 4 in. tall and Henry Hook who was awarded the VC was played as a drunk by James Booth but was in reality the teetotal son of a Methodist minister! And those white helmets? – well by the Zulu Wars these white helmets had been stained brown using tea to make it harder for the enemy to count rifles. 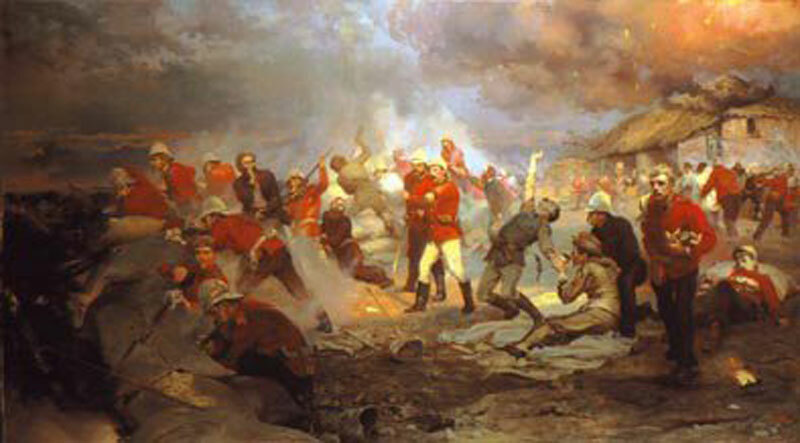 The Zulu War of 1879 is quite well known and the two battlefields that witnessed a disastrous massacre at Isandlwana and a heroic defence at Rorke’s Drift marked the beginning of the British Campaign. They both occurred on 22 January and involved 25,000 warriors in mortal combat, in which some 5,000 died. Their detail continues to generate a book a year and a regular stream of visitors to the battlefields. The iconic film Zulu (1964, Michael Caine’s first Oscar) is still aired on prime time TV in the UK and depicts the defense of the Mission Station at Rorke’s Drift. The commander of that defence was Lieutenant John Chard of the Royal Engineers, not quite the technical role for which he had been trained; he had quite a busy day on 22 January most of which happened in the view across the Buffalo River from the Rorke’s Drift Hotel. Chard was part of No. 5 Engineer Company who were making their way up from Pietermaritzburg and way behind schedule due to the heavy rain. They had taken three days to cover just 16 miles with their mule-drawn wagons. Chard leaves his unit and comes ahead up to Rorke’s Drift to take command of the pontoon rafts which are the vital link across the Buffalo River in the line of communication for the planned advance of the Central Column into Zululand. This column of some 4500 British Troops had used the pontoons to cross the Buffalo River that defined the boundary between Natal and Zululand, at the declaration of War on 11th January. They were keen to leave the congested conditions at the mission station which had also been host to the 3500 oxen and the several hundred mules and horses that enabled the Victorian Army to move. Crossing the River, the Military would have been able to find ‘fresh ground’ and accordingly camped in Zululand beside the River. By the time Chard arrives on 17th January the expansive camp on the Zululand side has been in place for a week while the Central Column carry out road building operations to move forward to Isandlwana. Like Rorke’s original drift, the roadway is not up to 200 wagons and all the other transport that is required for offensive operations, so a Military Wagon Road was made as well as improvements to the original Bridle Trail, which can still be seen today. The gentle hill that housed the multitude still carries the name Masotsheni (hill of the soldiers), as does the small cemetery just across the River opposite James Rorke’s original drift. While this great host is camped between the strategic pontoons and the Zulu Nation, Chard has no concerns about protecting his strategic crossing point. However, on the 19th and 20th January the column moves out along the roadway that they have built, to camp at Isandlwana. By the evening of the 21st the only troops left on Matosheni are the 500 men under Colonel Durnford, and he has received orders to move to Isandlwana the following morning. Durnford was also a Royal Engineer, so we can imagine that his and Chard’s heads were not far apart, making it very apparent that there is about to be no protection for the strategic river crossing from the following day. Alarmed by this development and dutifully following the protocol that an engineer should be protected on the ground by Infantry, Lt John Chard RE rises at first light on the fateful 22nd and rides the 12 miles along the trail, to the camp at Isandlwana, to clarify his orders. He finds that The General with half the force have gone out to confront the Zulus but from the remaining staff he is informed that the General’s deployment has taken his needs into account, and that he has been allocated a Company of the 1st Battalion of the 24th Regiment of Foot. He is at the Headquarters at Isandlwana below the rocky cliffs and is kindly offered some breakfast and lent a pair of binoculars (‘quite good ones, actually’; as he records in his journal later) with which he can see Zulus moving about and thinks that they may be heading towards Rorke’s Drift. Without further ado he mounts his faithful charger and leaves Isandlwana Camp at 9am. He returns the 12 miles along the Bridle Trail to the Pontoons, crosses the River and proceeds to the Mission Station. Here he demands from the senior officer Major Spalding, the whereabouts of the Company that should protect the pontoons. Spalding’s response is ‘ah yes we know about them; they are running a bit late and are up at Helmekaar. But don’t worry, I will go and hurry them along’. He looks at Chard and asks if he is senior to Lieutenant Bromhead commanding B Company of the 2nd Battalion of the 24th of Foot at the Mission Station. “You are senior so you will be in command. But don’t worry – nothing will happen, and I shall be back this evening later,” with which he trots off towards Helpmekaar. And we will catch up with him later. “The camp at Isandlwana has fallen to the Zulus, and we fear the same fate has befallen the General!” It is about 3pm. Other horsemen are also crossing the river at James Rorke’s Drift and give the same news to the Mission Station, perhaps more accurately named the Commissariat Depot. Chard and Addendorf hurry up there together and confer with Bromhead. They give orders to make fortifications with mealie bags and biscuit boxes, wagons and anything else that they can find. The Company of Natal Native Contingent (NNC) are put to work at this task; they number some 200 armed natives with white Non-Commissioned Officers (NCO). Earlier in the afternoon the Mission had heard cannon fire from Isandlwana, and a curious party decided to go to the top of the Shiyane Hill behind them, to see what they could see. The party consisted of Rev. Otto Witt, the Lutheran Pastor at the Mission, his clerical colleague Rev. George Smith who was acting as chaplain to the 24th Regiment, Surgeon Reynolds from the garrison and two other troopers. From the top they have clear line of sight to Isandlwana but the camp there is on the other side of the hill and all they can see is the wagon park, but Zulus moving across it! This is indistinct but what they can see is a body of native troops moving towards them and crossing the River. They see this body form up and advance to their right on the East side of their vantage point. It is only when they can see that the leading horsemen of the body have black faces that they realise that this is a Zulu formation heading for the Mission and not their own British troops. It is the fighting vicar George Smith who is reported to have shouted out as he came bounding down the mountain, over the rocks with the telescope under his arm “here they come! Thick as Grass and Black as Hell.” Otto Witt, the pastor, is distraught to find on his descent that his church and house are being barricaded and loop-holed by the soldiery, so mounts his horse and leaves to join his wife and family. The rest of the party are relieved to find fortifications being made as a result of the news from Addendorf and others who have escaped the massacre at Isandlwana. Chard authorised the plan to fortify the mission station, returned to the River to secure the pontoon rafts in midstream, sinks the cables so that they cannot be used, and posts a guard on the hillside overlooking them. He returns to the Mission Station and records a stream of fugitives from Isandlwana who pass him and his men at the Mission, as they head for safety at Helpmekaar. Some stop and tell the garrison of their experiences and are firmly removed and sent on their way. Part of Durnford’s command of horsemen comes as a formation, and over 100 strong, go to the East side of the Shiyane Hill to confront the oncoming Zulu Impi of 3500. Their efforts do not last long and they quickly fall back with their officers reporting to Chard that they cannot hold their men; they flee for safety towards Helpmekaar. On their departure, the nerve of the Company of the NNC breaks and they flee their posts. The garrison at the Mission Station has in a few moments shrunk from 450 to 150; unsurprisingly shots are fired at the fleeing NNC and one NCO is shot in the back – to be recovered the following morning. Chard and his commanders have retained the morale of the remaining defenders but now have the problem of shrinking the defensive perimeter for one third of the planned force, and this means making a plan to evacuate the patients from the hospital. All to the background noise of the Zulus drumming their assegais on their shields as they advance on the post. The Zulu attack starts at 4.30 in the afternoon and continues throughout the night. That is a story in its own right, with Chard in command and he and ten comrades are awarded the Victoria Cross for their achievements. But his busy day is fast approaching nightfall so we have to leave his story there. View of Shiyane Mountain; Isandlwana on the skyline above the Buffalo River and Rorke’s Drift Mission Station in the trees at the right. Rorke’s Drift Hotel is the building above the left end of the bridge. The vantage point of the photo became Fort Melvill and John Chard’s pontoons and his tents at the left lower corner of the picture. Chard’s travels on 22 January 1879 are all within the view of the Rorke’s Drift Hotel which is on the banks of the Buffalo River with stunning views of the pontoon location, Matoscheni and down the River towards Isandlwana. His day is just one of the movements along the line of communications, which of course continued with the return of The General with his column the following day, hoping to find survivors from their camp at Isandlwana. That was a forlorn wish, but at least they found the garrison at the Mission Station who had withstood the assault of some 3500 Zulus for some 12 hours. So, what happened to Major Spalding? He never actually reached Helpmekaar since he found coming towards him, two companies of the 1st/24th. One was to protect Chard’s pontoons and the other was to support the known to be weak B Company 2nd/24th at the Mission Station. They march down the hill and towards them come horsemen who have escaped from Isandlwana and have passed Rorke’s Drift. So Spalding and his troops know what has happened at Isandlwana and that the Mission is under attack. They come within sight of the hospital and stores, just some 3 miles away at 5.30pm. They see the attack by the mass of Zulus and that the Hospital is on fire. Do they try and fight their way in to the rescue? Their decision and their action, was to return to Helpmekaar. Charles Aikenhead is a partner in Campaign Trails Adventures and divides his time between his house in Ladysmith and a family home in the UK, to cover business and family interests. His boyhood in Zimbabwe and Zambia was followed by public school in England before a commission in The Irish Guards with active service in Aden as well as tours in Hong Kong, Belize and Cyprus. Leaving the Army in ’74 as a graduate mechanical engineer he has had a commercial career in the supply of capital plant for cheese manufacture and packaging machinery throughout the UK and Ireland, and has now handed over the company he started in ’81 to his elder son. His return to Southern Africa in 2000 was to commemorate the centenary of the foundation of his Regiment. He initiated the Ladysmith Swartkop Challenge and has written several articles on The Anglo-Boer and Anglo-Zulu Wars. His speciality is combining adventure training activities with battlefield visits for serving units of the British Forces. Lawn House, Cornard Tye, Sudbury CO10 0QA.